I joined WildCRU in 2013 to commence my DPhil. I’m originally from Brisbane, Australia, where I previously studied marine mammals, specifically examining variation in the hindgut microbial communities of the Florida manatee (Trichechus manatus latirostris) over winter in Crystal River, Florida. My thesis at WildCRU investigated the anthropogenic threats facing Madagascar’s largest carnivore, the fosa (Cryptoprocta ferox). 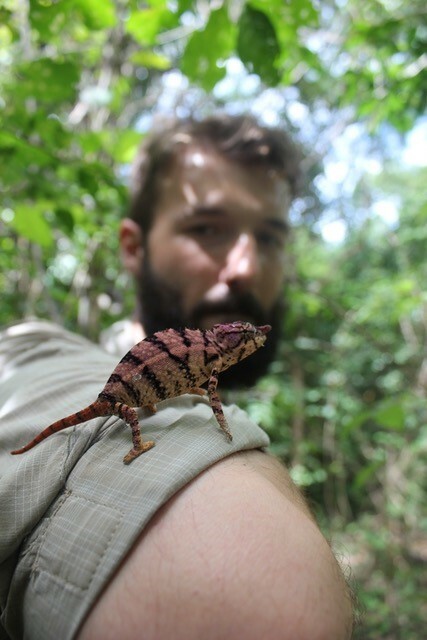 During my DPhil I spent nearly a year living remotely across Madagascar conducting research in several of its most important forested regions, namely Ankarafantsika and Andsibe-Mantadia National Park, Andranomena Special Reserve and Kianjavato. My research specifically examined the socio-economic, geographic and cultural drivers of poaching for bushmeat and retaliatory killing of fosas for livestock depredation. I also investigated the impacts of anthropogenic habitat disturbance and exotic species presence on the spatio-temporal occurrence of fosa through large-scale camera-trapping in forests of varied disturbance. Since departing WildCRU I have commenced work at the Zoological Society of London in their Conservation Programmes as the project coordinator for Mongolia. My current work focuses upon the illegal wildlife trade in Mongolia, large-scale monitoring of Mongolia’s threatened wildlife, such as the Bactrian camel, and building the capacity of Mongolia’s conservation sector.